The Miller015394 32321work01539 433251fax Self-cateringThis spacious apartment over two floors has been completely renovated to a high standard, and provides three bedrooms and three bathrooms making an ideal home from home for families and couples. Situated by the tumbling Stockghyll waterfalls only a short stroll from Ambleside village and Lake Windermere and with many walks from the door it really is a perfect holiday destination. Accommodation: Private entrance at first floor level from shared internal staircase. Entrance hall with separate cupboard for coats and boots. All three bedrooms are on this level - Master bedroom with king-size bed, easy seating and en-suite with large shower, basin and wc. A double bedroom. A twin bedroom with easy seating and en-suite with bath with shower over, basin and wc.Family bathroom with bath with hand held shower, basin and wc. 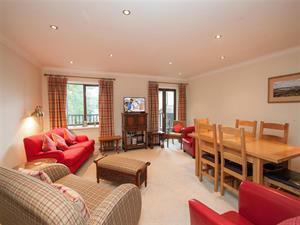 Upstairs is a spacious lounge/dining room with TV, DVD, CD, free Wi-Fi and balcony with fell and waterfall views. Well-equipped contemporary shaker style kitchen with stone worktops. Separate wc with basin. Furnishing and decor throughout are stylish and tastefully chosen to create a relaxed and homely atmosphere. Gas central heating makes the property cosy in any season. Outside: Balcony with some fell and waterfall views. Private undercover parking for one car (height restriction 1.95m) and other visitor parking onsite. Ambleside village amenities less than 10 minutes' walk. The Miller offers weekly bookings starting on Saturday. This spacious apartment over two floors has been completely renovated to a high standard, and provides three bedrooms and three bathrooms making an ideal home from home for families and couples. Situated by the tumbling Stockghyll waterfalls only a short stroll from Ambleside village and Lake Windermere and with many walks from the door it really is a perfect holiday destination.